The OSGi Alliance are holding their next Expert Group technical meetings in Stockholm at the end of this month. 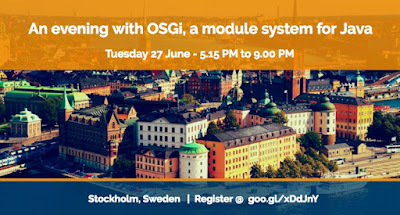 Jforum has kindly arranged 'An Evening of OSGi' while the technical experts are in town. This is taking place on Tuesday 27 June, 2017. Registration starts from 5.15pm and there will be some snacks and drinks available. Registration is essential. You can find out more information and register at goo.gl/xDdJnY.